More bad luck for Wiggins hampered him in the time trial and, despite finishing second, he will be very disappointed with how the day panned out. He would fully expected to have been in the Maglia Rosa tonight, so to find himself 1m16s down on Vincenzo Nibali has put him in a difficult position. The early part of this stage will see the contenders for the mountain jersey likely to take centre stage. With the first category 1 and category 2 climbs of the race, there are plenty of points at stake. As a result, it would be no surprise to see the favourites involved in a breakaway to try and grab the points. Stefano Pirazzi has been very active so far and it would be a surprise not to see him involved. At almost 8 minutes down in the GC, the leaders will have no problem letting him go away up the road to begin with, but they would likely chase down the break eventually unless he drops back. Vini Fantini will be desperate to get someone in the break having missed it a couple of days ago. Fabio Taborre is the logical contender to get into the break and he has been very active thus far, so I would expect him to try and find his way into the breakaway. They are also covered if the breakaway is caught as Danilo Di Luca has attempted to solo his way away from the peloton twice already, and it would be no surprise if he attempts this again. Another team that will look to put someone in the break is Androni. I have already mentioned him in a previous preview, but Miguel Angel Rubiano Chavez is a prime candidate for this type of stage. He has won stages like this in the past and will hope to do it again. Giovanni Visconti is another obvious candidate for the break. He is targeting the mountains classification and is far enough down in the GC not to be a major worry. If he is unable to, the other option for Movistar would be Eros Capecchi, who has struggled so far, but will be hoping to make an impact soon. If the three Italian teams - Androni, Bardiani and Vini Fantini - all manage to get a rider into the breakaway, there is a decent chance that it might make it all the way. There would be very few teams that would be overly bothered about chasing it down, so this is the main focus of our bets for this stage. If the break is brought back, the final climb is perfect for an attack from someone looking for a solo win. 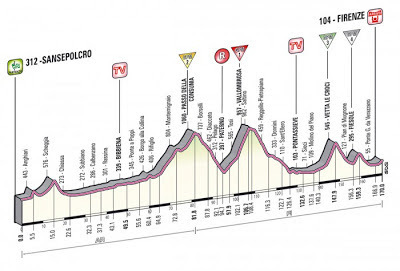 This would be where the likes of Danilo Di Luca, Matteo Rabottini or Giovanni Visconti were he to miss the break. However, with the likes of Wiggins and, particularly, Hesjedal having lost out in the time trial, there is a chance that they may look to attack the other GC contenders. In this situation, there is every chance that they could catch the break, so it is worth covering ourselves. Enrico Battaglin is the one to look at, given how well he has climbed so far and he is clearly the quickest man in the leading group right now.